Daily Debate: Should the Master Sword have had the Power Earned By Completing the Trial of the Sword from the Get Go? The Master Sword is quite the staple of the Zelda series. After all, a hero needs his weapon, and what better to wield than the sword of a patron goddess, the Blade of Evil’s Bane? I mean, just the name sounds wicked. Yet, in Breath of the Wild, a game notorious for flipping the series on its head, the Master Sword wasn’t even the strongest weapon in the game. Far from it, actually. It sat at a mere base damage of 30, and really only saw a boost in this around Guardians and the Malice-infested ruins of Hyrule Castle. Link still had to work for it, still had to go to the ends of the Earth to garner enough strength and pull it from its pedestal, and the only real benefit of the token weapon was that it did not break — it just lost power for a bit. I have to admit, I was a tinge disappointed by it, and found myself favoring other, stronger swords in my fights. Icon or not, I needed weapons that got the job done. Then, with the DLC, came the Trial of the Sword. A test of the hero’s mettle, in three sets of multiple levels. 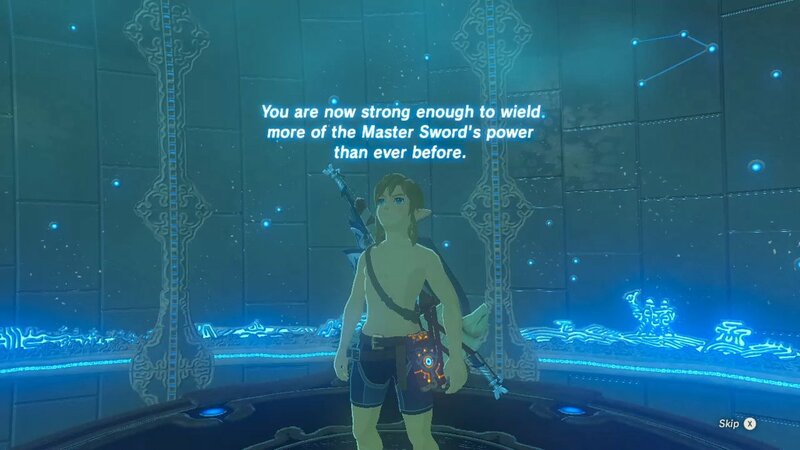 With the completion of each set, the power of the Master Sword was enhanced a little more. Once all three sets of trials were complete, the Master Sword was boosted to its full damage, at all times. And I thought that was actually pretty neat. Frustrating at times, because you can’t save, and if you die, you go back to the beginning of each set. Still, the premise of the Trial was to strip you of everything you had come to rely on, essentially putting you all the way back at the beginning, and forcing you to think, strategize, and prove yourself worthy of the Master Sword’s full potential. It isn’t necessary to beat the game at all, but it’s an interesting little challenge you can take, if you so choose. But, was it worthwhile? Should the Master Sword have just been given its full power from the beginning? Or did you enjoy having the freedom to test yourself as you saw fit, with promise of a boost as a reward? Let us know in the comments below!